The newest addition to the RS Recovery Ltd family. 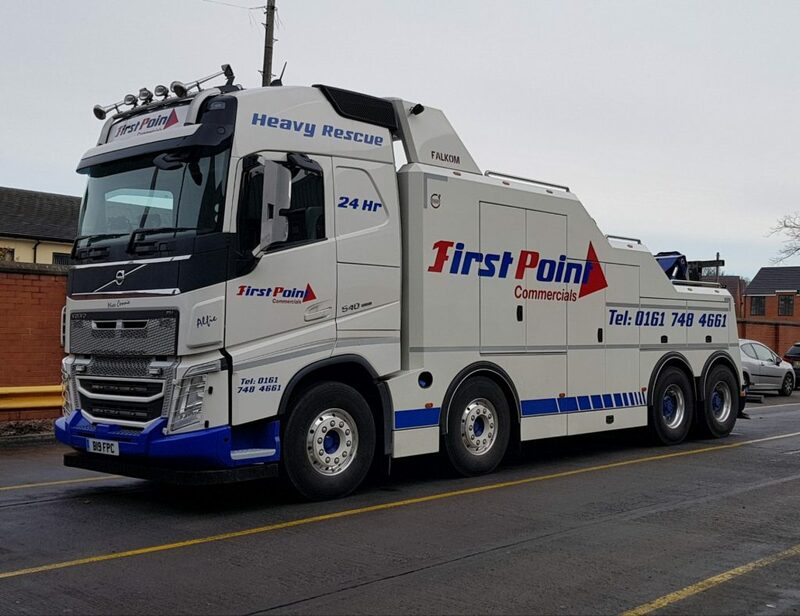 Previously owned by First Point Commercials in Manchester, we snapped at the opportunity to acquire it. Its 8×4 chassis with Globetrotter cab, 13-litre engine, I-shift transmission and was custom-designed and manufactured at the the Netherlands-based Falkom factory. Fitted with the FAW 25.000 kit, the top boom equipment has a 25-tonne lift capacity and an underlift capacity of 10 tonnes at its full reach of 4.5 metres. The front-steer axles are rated at nine tonnes each and the rear axles are air-suspended, double-drive, hub-reduction rated at 26 tonnes. The 2017 Euro 6 chassis will also enable us to meet the Low Emissions Zone criteria for travelling into London and the impending zone for Birmingham City in 2020. It has been kept immaculate by the team at First Point Commercials but we’re looking forward to getting it in our colours in 2019.